Looking for free audio converter to convert other audio format like FLAC to MP3 here you can have one for free. I mean it’s really free because we gonna use a media player to convert audio file. The media player I am talking about is AIMP and it’s a free license program. If you need an audio converter plus a cool media player you will love AIMP. But before we begin to find out how to use it as an audio converter, you may need to read a short review o the software. 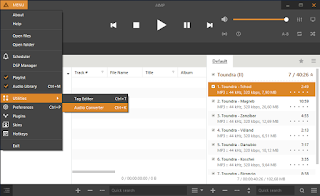 AIMP (Artem Izmaylov Media Player) is a freeware audio player for Windows and Android, originally developed by Russian developer Artem Izmaylov. The first version of AIMP, dubbed “AIMP Classic”, was released on August 8, 2006. AIMP was initially based on the BASS audio library. Version 3 added a new audio engine and full support for ReplayGain, and revamped the music library interface transparency effects. As Media Player AIMP can play almost all audio format and also can play Midi file too cool eh? visit http://aimp.ru or Wikipedia for more information about AIMP feature. Okay! let’s find out how to use AIMP as Audio Converter for your mac or Windows computer. Yeah! a free audio converter! Okay! First, go to http://www.aimp.ru/ and download the latest version of this software if you are new about this app or if you already have this application installed on your system and don’t know if this app has this feature. 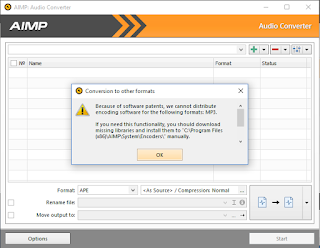 By default, AIMP doesn’t have mp3 decoder so in order to make AIMP also capable to format any audio’s file to MP3. 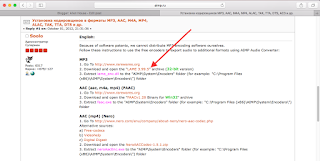 So you will need to download the mp3 decoder file and install it manually. Aimp also has a feature like Sleep Timer and Alarm build in. By the way, I’ve been using AIMP since version 2 till now version v4.11 and I think this is a great multi–function software as it is a freeware! Okay! I hope you found this short post useful. So! Thank you guys for visiting my blog and please feel free to leave a comment below.